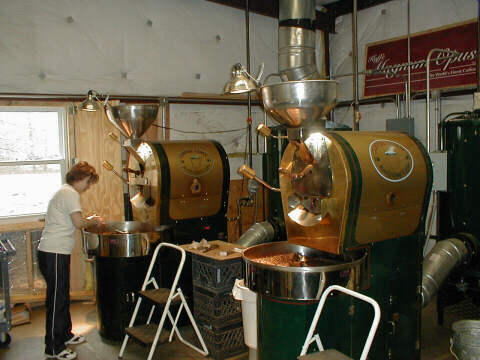 This picture serves to show you two batch roasters in the corner of our roasting room (mouse over image for larger view). This is a plant. Each will do from 1 to 25 pounds of green and we use them to roast your special roast color or blend or whatever. They have been cruising along for 10 years (left) and 8 (right) and just getting started. Freshness. You have to have batch roasters and be willing to do small batches every day, day in, day out, in order to roast to order. It is tough, and can be expensive to do a small, say 3 pound roast, but we do it. Hail to the roaster. If the roaster you are thinking about has only very large roasting machines, then I ask: Can they roast to order? Freshness and then again, freshness. This is the single most important quality point in the retail coffee business. The closer to the roast you get your coffee the better the cup will be when your customer gets it home and brews. Your roaster should run every day and roast your coffee to order. Very few of us actually do this. I remember a day when the gentleman who manufactures our roasting equipment was in our plant and he watched in amazement as we took orders, roasted, favored and packed and shipped. He told me we were one of very few company's that did what we do. But I and my associates are very proud to do it. They should be easy to do business with and quick to satisfy. That is ETDBW. See Enthusiasm. No questions asked. Now no one will or can afford to guaranty your pallet. So you may not like the flavor you ordered. I would not expect your roaster to quaranty you will like it. But it should be what they say it is and the size, aroma, flavor, taste, look and feel, and most important, cup quality, should be what they said it would be. Sometimes you may think it isn't. So send it back. I will say that in the last 10 years there are time when we have received returns, which we always inspect and taste as a Quality Education Check, and they seem fine. That is, they are what we said they were. But in our case we don't ask, we just do and try to be very easy to do business with. We know when you are just getting going you worry. One of our jobs is limit the anxiety and help you get through the first 100 days. And we do it without a cabinet! Know your coffee and have a wide selection. Wide, very wide selection. If you are going to put a hundred to 200 coffees on your wall your roaster has to have them in stock to roast and ship to order. What can I say. Tonight, March 13, 2002, at 5:45 PM, Dolores Deneault our first sales person, who lives in New Hampshire, called and told us that UPS had lost a box of 20 pounds for GMR, a customer. Desiree ran to stop the UPS driver who was leaving, ran back to the other end of the plant, got Lisa, employee number 3 as we say affectionately, and the two of them packaged, sealed and shipped early AM overnight the replacement coffee. I almost cried because this kind of enthusiasm is irreplaceable. It drives a company. It makes it successful. And I will be forever grateful for this single event, as it is telling. We love this business and we will do anything to ensure its success, for we know that your success depends on us, and our success depends on you. Here is a selection of items I use in my business. They are located in our tasting room, conference room, training room, meeting room, brewing and tasting room.